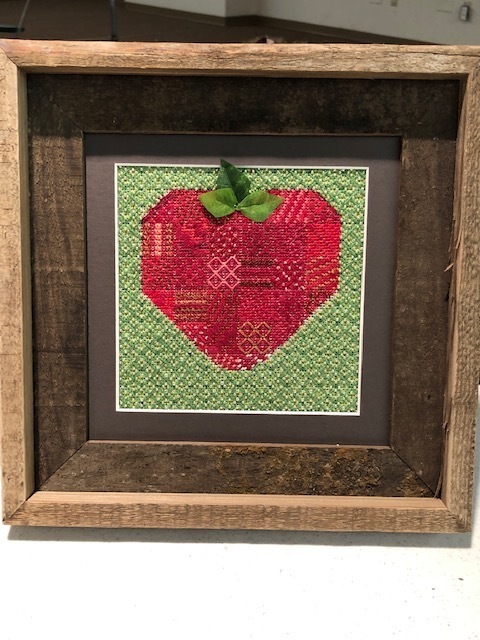 Members of Colorado Columbine Chapter, ANG, will meet in March, 2019, to begin a class based on a popular ANG stitch guide called, ‘Honey I Shrunk the Heart!’ Sue E. has adapted the heart to a strawberry shape, and loaded the beautiful design yummy colors and beads. 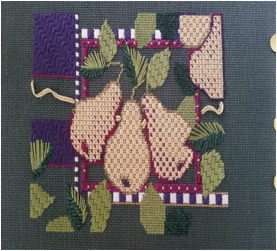 It is one of the classes offered by the group that encourages use of threads already owned, and patterns offered by the American Needlepoint Guild. Upcoming months will have an annual dinner and installation of new officers; a very popular class on How to Tackle a Painted Canvas; and a back-by-popular demand session on how to use ribbons on needlepoint canvas! 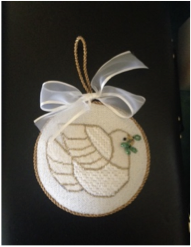 Colorado Columbine ANG needlepoint stitchers are taking a holiday break before resuming classes and meetings on January 21, 2019. Signups for all events are displayed at each meeting, giving everyone a chance to participate. Upcoming classes feature a Kathy Rees counted design, a spring strawberry, a ribbon tutorial and a class on how to tackle a painted canvas if one lacks a stitch guide! In the meantime, Happy Holidays to all and get stitching! 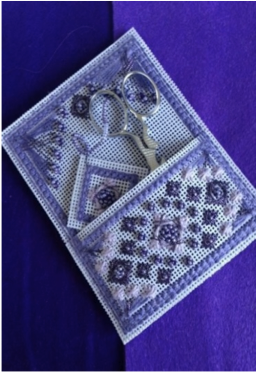 Denver stitchers will induct new Colorado Columbine Chapter board members on April 16 to kick off a new phase of needlepoint offerings! Members are always treated to a catered dinner as they welcome a new slate of officers. 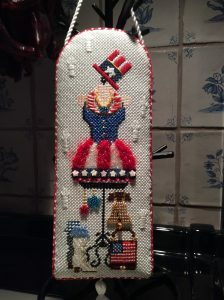 In July, we get to jump in to this delightful scissors case, laden with beads and counted stitches! 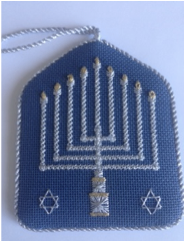 Happy holidays to members of Colorado Columbine Chapter of the American Needlepoint Guild! 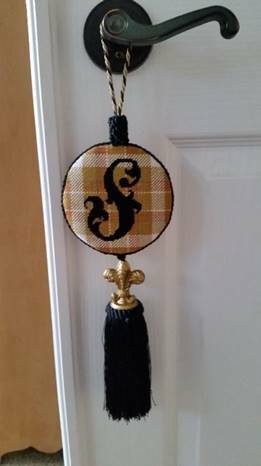 On January 19, 2018, we will be stitching a Heidi Stanley piece, a monogram which will be individualized with a special plaid chosen by each stitcher. The class is closed, but it will be fun to see what develops! On February 20, a charming paper scissors case will be our focus, all beaded and stitched on perforated paper. This will make a beautiful piece to display in our stitching rooms! In March, a stunning Ruth Schmuff piece called Gilded Pears will be taught by Julie, its rich colors on a dark background that is going to be fun. Then in June, just in time for the Fourth of July, we will be stitching a perky Painted Pony Patriotic Dress Form just for fun! See you there. 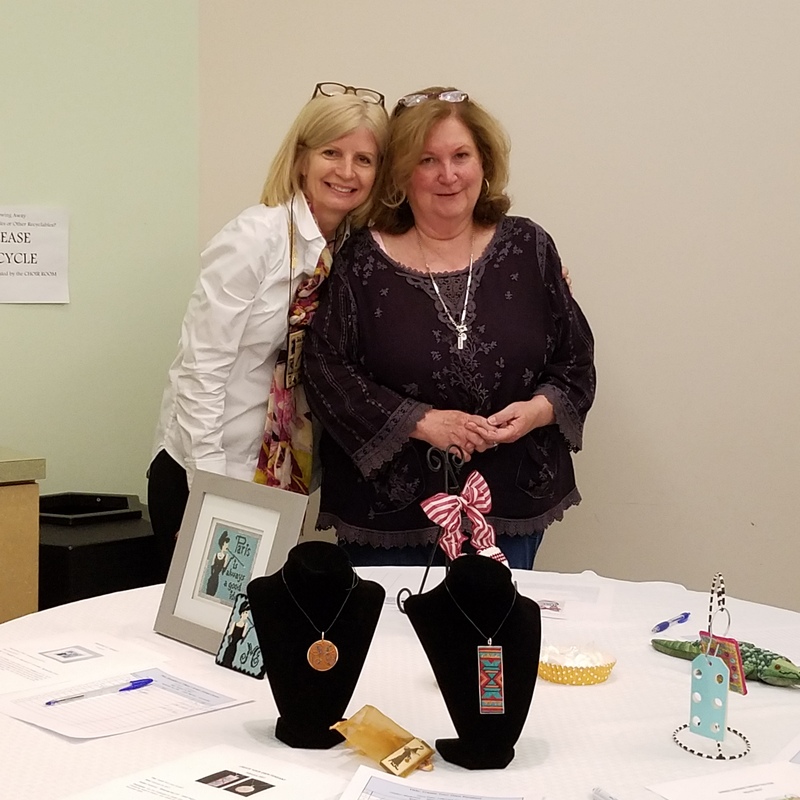 We had such fun at the July meeting with Open Stitch night. It was awesome to chat and see what everyone is working on! Nothing short of amazing IMHO! As we head into fall, I need to start collecting the 2018 membership dues. I started collecting checks at the July meeting and hope to see all of you in September at the meeting. Of course if you can’t make it you can always mail our fearless leader/president, Gloria, a check (Please refer to your Members Directory for her address). Dues haven’t increased this year (again!) and are $26.00. Please make your check payable to CCC-ANG. The deadline for collecting dues is the October meeting so don’t delay in sending in your dues.. so you can get back to stitching! Reminder, you must be up-to-date with your national dues as well. Thanks in advance for staying on top of your dues and see you all in September! It’s summer and the Fourth of July on our minds. There is nothing more fun than stitching an American flag or any patriotic motif in needlepoint! 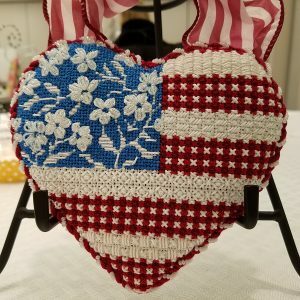 Denver members of the Colorado Columbine Chapter of the American Needlepoint Guild will meet in June to stitch a Kirk & Bradley design, Floral Flag Heart. It’s all sparkly threads and cute checks. Thank you, ladies!! Our photography is by Karen B.
Spring-green needlepoint in Denver is underway! He’s big, he’s green, but he’s not mean! 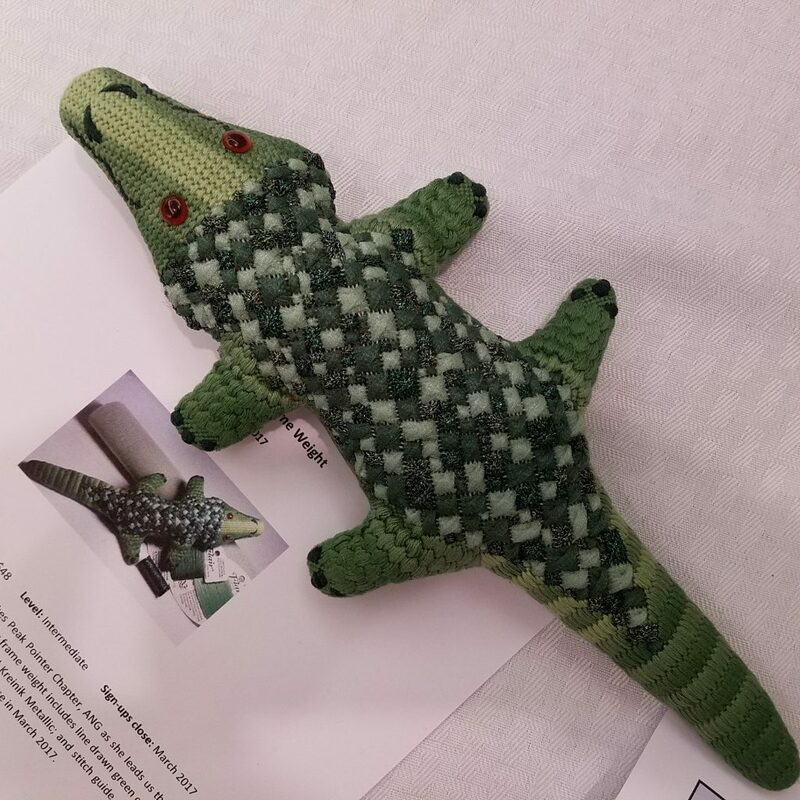 Denver needlepointers are about to be delighted by a special guest, Mr. Al E. Gator, who is in the wings with a wonderful guest instructor, Gretchen W. She will guide the Colorado Columbine Chapter of the American Needlepoint Guild through a class of fun stitching on May 15, 2017, to create this charming frame weight. Fab photography by our own Karen B.
Needlepoint in Denver is off to a rousing New Year start! 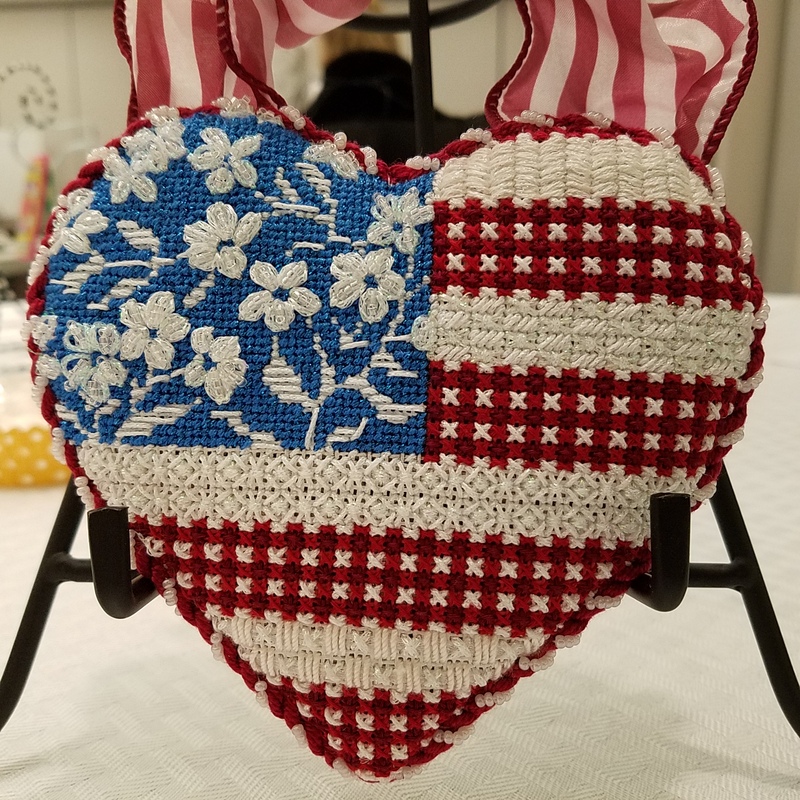 KIRK & BRADLEY 4TH OF JULY FLORAL HEART FLAG, will be taught by Vickie at the June 19, 2017 meeting! This little jewel has sparkles galore, with a variety of stitches creating the stripes and flowers that practically jump off the blue field. Cost is $79 if you use your own stash of threads; a bit more if you buy the suggested threads, so put some summer fun on your calendar! Sign-up for this delightful design’s class is the JANUARY 16 meeting!! 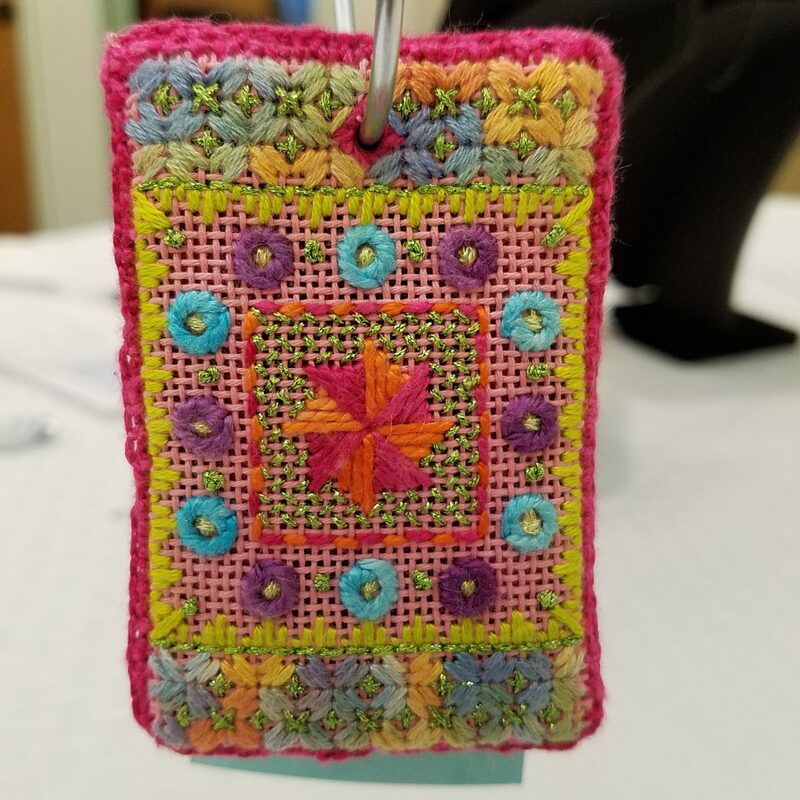 Above, see SPRING GARDEN FLOSS TAG, taught by our very own Madonna on March 20, 2017. 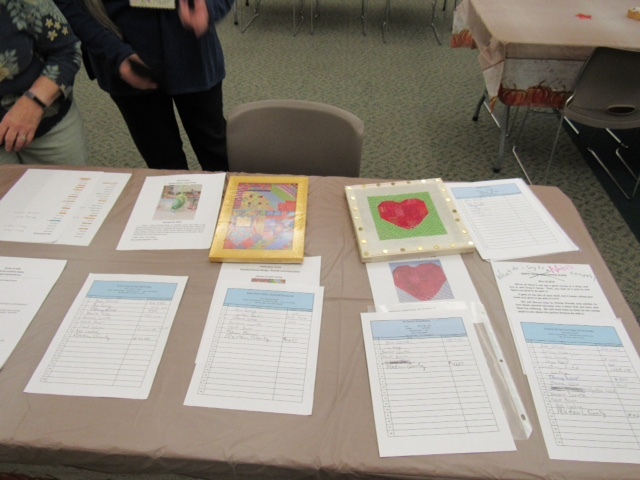 Cost is just $26, but eager stitchers must sign up no later than January’s meeting (the 16th)! Then, while you’re at it, be sure to put your names down to meet Mr. Al E. Gator, our fabulous guest at the May 15, 2017 meeting. Only catch is, you will be creating your own ‘Al’ with instruction from wonderful teacher, Gretchen W. The cost is a modest $48, so take a look at this attractive gentleman and sign up for him at the March 20 meeting at the latest. He will work hard as a frame weight for all your canvas sizes! ** Note that payment in full in required upon close of registration, so that the classes supplies can be purchased and kitted in time. We are presenting the programs well in advance for Spring 2017, to allow everyone adequate time to register. Thank you! All fab photography by our own Karen B.
Stitching goodies on tap for Denver needlepointers! Colorado Columbine needlepoint stitchers, look what’s coming up in the new year! Sign up THIS MONTH to get in on these wonderful classes! 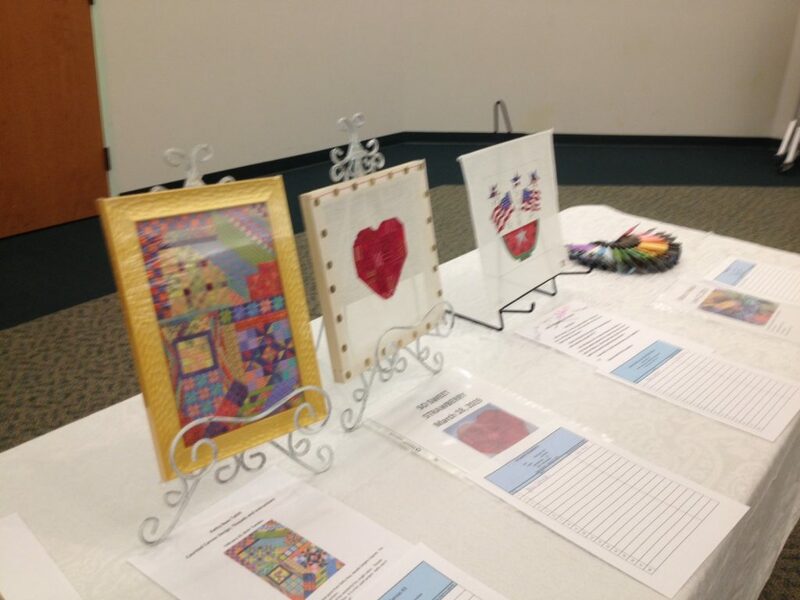 Aaand, the sign-up deadline for another class is the January 16 meeting, the painted-canvas design by KIRK & BRADLEY 4TH OF JULY FLORAL HEART FLAG, to be taught by Vickie at the June 19, 2017 meeting! This little jewel has sparkles galore, with a variety of stitches creating the stripes and flowers that practically jump off the blue field. Cost is $79 if you use your own stash of threads; a bit more if you buy the suggested threads (list will be available at the November meeting), so put some summer fun on your calendar!